Whether it’s the marginalization of Globeville, Elyria, and Swansea residents, the stark threat of respiratory illness, or the simple fact that widening roads does not solve traffic congestion, the I-70 expansion planned between Brighton Boulevard and Tower Road is a terrible idea. Still, the highway project with a $1.8 billion starting price tag has a lot of political momentum. Streetsblog looked into the funding mechanisms for one of the most expensive road projects in Colorado history, and it turns out that the I-70 widening is already diverting money from other priorities. About 300 miles of protected bike lanes, enough to create an effective citywide network. One year’s worth of RTD passes for 52,742 people. 296 miles of badly needed sidewalks, or 20,408 high-visibility crosswalks. DRCOG manages the flow of federal transportation money to the Denver region (which somehow includes Weld County). Representatives from 56 metro area governments comprise the council, which is responsible for deciding which projects get funded and which don’t. So DRCOG meetings are like a miniature UN, its members both cooperating and competing for funds. The $50 million contribution went forward, though, along with allocations for other road projects. In the end, 69 percent of the $266 million in federal funds went toward roads — and most of that went toward expansions, not maintenance. Only 28 percent went to transit, biking, and walking. DRCOG Director of Transportation Planning and Operations Doug Rex said the vast majority of the road projects — he estimated 95 percent — include some sort of biking and walking feature. But that doesn’t excuse spending $50 million to make I-70 five lanes in each direction, especially since it’s been proven time and time again that widening roads creates more demand for driving, resulting in equal or worse congestion. 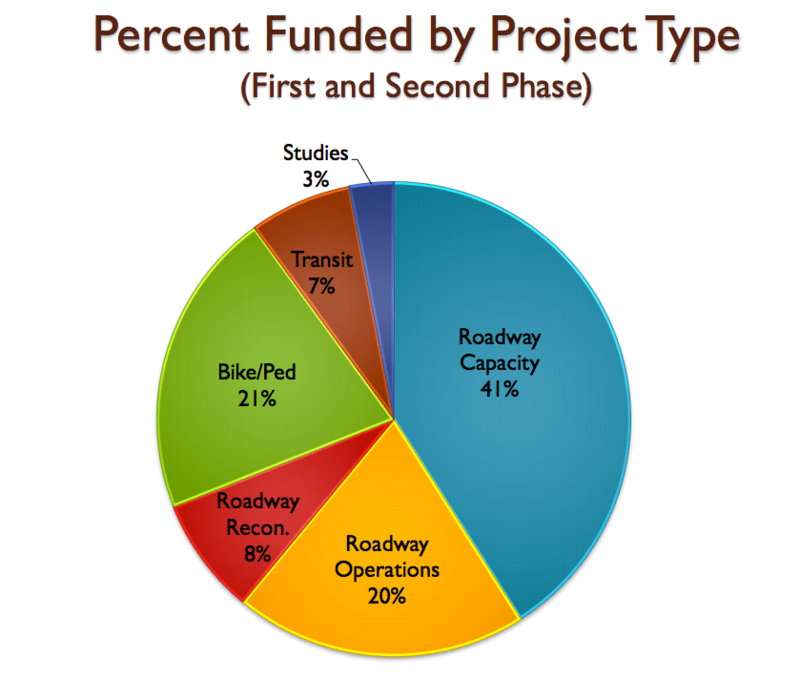 In fact, DRCOG’s appetite for road widening undermines its spending on other modes. By inducing more car traffic and facilitating spread-out development, the agency is making the region less walkable and bikeable. And with every road expansion, DRCOG is effectively shrinking the potential pool of riders for Denver’s light rail — another recipient of DRCOG funds — which works most efficiently when serving compact, walkable areas. Fixing the dilapidated viaduct on this portion of I-70 would be consistent with those goals, but widening it is not. I feel like the park is just a little bone being thrown to satisfy those against the road widening. Perhaps. Let’s call it Appeasement Park from now own. Exactly. This project is road widening with a park attached. To clarify, this is not a general purpose lane widening. The new lanes will be tolled managed lanes. So the studies on “widening doesn’t solve congestion” are inapplicable here – it’s the tolling that will manage congestion in 2/5 of the lanes. I was involved in this project on the community organization side while working with UC Denver’s applied planning research lab. 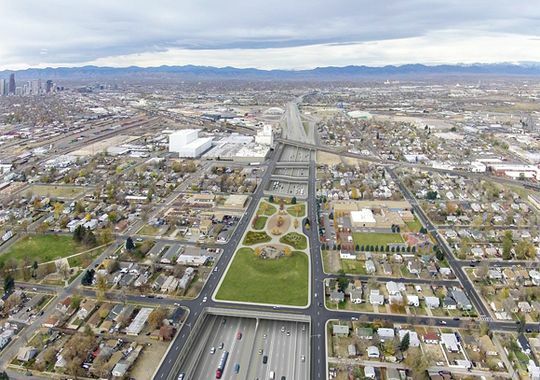 Replacement of the viaduct was the original proposed alternative in the draft EIS until CDOT received massive pressure from stakeholders, community leaders, AIA and local politicians. Let me state this unequivocally: the freeway cap is a MUCH BETTER alternative than replacement in kind of the viaduct. From every angle (eminent domain, air quality, real estate values, social justice/equity, public acceptance, transportation access and mobility) this is a win for the city and communities in Globeville and Elyria/Swansea.